Cats and why they should be kept inside. Cats! Everyone loves them (almost). They’re simply our favourite independent animal! Although we share a love in our feline friends, they are some things that cat-lovers debate upon: should a cat be kept indoors? Read along as I explain my top points as to why cats should be kept indoors. There are several diseases which are deadly to cats, one of which is FIV. It is highly contagious, is incurable and has no vaccine. The only way to insure that your beloved kitty does not catch it is by staying indoors. Cats may not show symptoms until years after the initial infection occurred. Although the virus is slow acting, the cats’ immune system is severely weakened once the disease takes hold. This makes the cat vulnerable to various secondary infections. Infected cats who receive supportive medical care are kept in a calm, stress free, indoor environment where they can live comfortably for several months to years until the disease becomes chronic. All this is only one of the diseases that cats can face. One of the greatest dangers of all to cats are humans. Many cats are run over by cars each year. Around 250,000 cats were run over in 2017 in Britain alone, equaling to about 630 cats per day. Although these were unintentional, humans are also known to cause intentional harm to cats. Whether it’s an angry neighbour, tired of the cat trespassing on their lawn, or some bored juveniles who have nothing more to do. They have been known to kick, set on fire, shoot etc. cats that happen to cross their path. Then, there are snatchers (or “bunchers”). They patrol around neighbourhoods, searching for a cat or dog friendly enough to go near them. They kidnap the cat and later sell them to labratories to test products or to “dog trainers” to use as bait while training their fighting dogs. 3. How cats can be happy indoors. Although in some cases cats can become obese or inactive from staying indoors, there are many ways to prevent this. You can get “cat trees”, which have beds, scratch posts and fun toys all in one. Since cats like to get the high ground, they will most likely adore the highest bed there is! Your fluffy friends will probably see this as their own personal palace! You can get sticks with a false version of some cats natural prey, like a mouse or a ball of feathers. This false prey is attached to a string that is tied to the stick. Cats love this! You can also get a laser pointer, as cats will happily chase the red dot for hours! Make sure to have a scratch post so that the cat doesn’t take to using your furniture as one. There are plenty of other cat toys you can get, so you can use a different one each time so the cat doesn’t get bored. How many cats are run over each year? Posted on March 31, 2018 Author margo	No Comments on Happy Easter! Hey Guys! 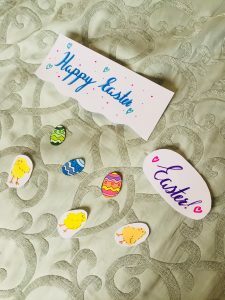 Check out some Easter decorations I made, just in time for Easter! This is my first post ever, welcome to Margo.arteemio.com! I will be posting artwork, pictures and thoughts here.